In a move that will confuse those who simplistically assume that a Marxist regime doesn’t normally officially endorse the religious concept of reincarnation, China has published its first list of “authentic living buddhas”, saying that growing numbers of fraudulent buddhas are using their status to swindle money from believers. Beijing has taken the unusual step of concerning itself with such matters by releasing the names, photographs and locations of 870 “verified” buddhas on the website of the State Administration for Religious Affairs, Xinhua news agency reports. It’s a move that’s been praised by one of the men who features on the list. “As a living buddha, I feel genuinely happy about it,” Drukhang Thubten Khedrup tells the state-run news agency. According to China’s religious affairs agency, the system has been inaugurated to counter “fake” buddhas who are undermining Tibetan Buddhism by cheating believers out of cash. However, the spiritual cataloguing scheme has already been criticised as a means of further controlling Tibetan affairs. “This living Buddha database and the whole policy toward reincarnation is clearly a pre-emptive move by the government to control what happens after this Dalai Lama,” Amnesty International’s Nicholas Bequelin told Time magazine in December 2015, when the list was first announced. It’s also seen as a means of confirming state choices for other religious appointments. Tenzin Gyatso, the 14th and current Dalai Lama, is – according to Buddhist belief – a reincarnation of a past lama who decided to be re-born again to continue his work. He has been based in India since fleeing Tibet after the unsuccessful 1959 uprising against Chinese invasion. 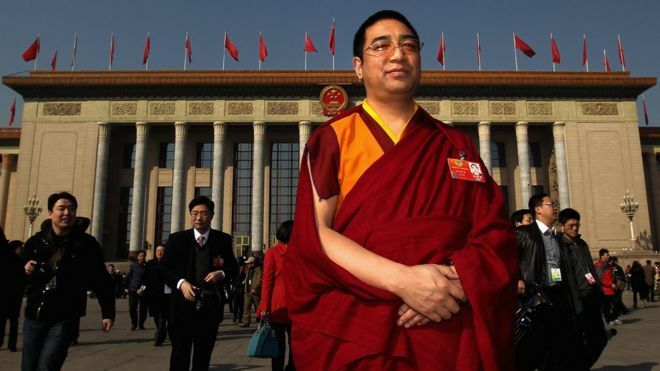 In 1995, both he and Beijing appointed different boys as Panchen Lama, the second most important role in Tibetan Buddhism. Now aged 25, China feted the lama on the 20th anniversary of his enthronement in December, presenting him as the one, official holder of the role. What might be more helpful than dabbling in such esoteric matters, especially to create political advantage, would be for the Chinese regime to normalise relations with what is now called the Tibetan Autonomous Region and to allow the Dalai Lama to return as spiritual head of the country, rather than absolute ruler. The occupation of Tibet is now a political fact. It is now surely time to address the many complaints of the indigenous Tibetan people against the newly-settled Han Chinese, and to allow the area to retain its traditions while continuing to enhance matters such as health outcomes and economic growth. Isn’t that interesting. My take on Buddhism was always that Buddha, though divine, was perhaps more analogous to a saint than to a God. I would certainly take a dim view of any government trying to tell me who is and is not a saint. Hell, I don’t even agree with the Pope half the time – even this Pope (Junipero Serra was a terrible mistake). Which leads us to a whole other discussion of what “divine” might actually mean, but that’s too complex for today!